No more difficulty installing filters inside the furnace! 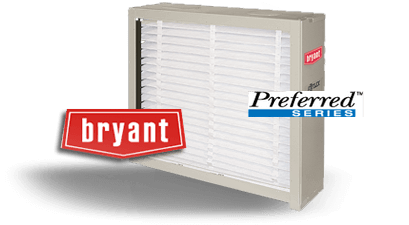 Bryant’s filter cabinet is a separate box which has its own door, providing easy “slide-in-slide-out” filter replacement. This is a low maintenance, inexpensive option which allows you the flexibility to determine what balance between air filtration efficiency and cost you want. Whether you want a higher grade, more expensive 4″ filter for very good air cleaning or are satisfied with inexpensive, decent air purification from a 1″ filter; you have the choice. The filter cabinet requires no cleaning; only replace the filter periodically (every 3 to 8 months relative to the filter efficiency and your usage).